The area right around Alameda High School has been a good one for DOTS cars; within a block of today's car we have the '68 Ranchero, the '78 Jaguar XJ-6, and a couple other cars I haven't got around to posting yet. This car always parks in the same spot next to the school; the interesting thing about this to me is that, during my days at AHS, the crypto-hipster English teacher who came the closest to credible lust-objecthood for teenage boys (being the only female teacher under 50 certainly helped) drove a beater '63 suicide-door Continental and parked it in this very same spot. Is this spot reserved for mean-looking Continentals only? If so, the city needs to make it official with some signage! Ah, suicide doors. The name alone makes them cool! Sadly, 1969 was the final year for this essential feature. Jeez, Ford, just put big warning labels so backseaters don't open them while the car's in motion and they'll be totally safe! I like to think that fellow AHS alum Jim Morrison rode in the back of this car when it was new, preferably while passed out from overindulgence in Seconal/Wild Turkey peyote-enhanced highballs. Wow, maybe the crusty remnants of the Lizard King's puke remain under the carpeting! For '69, you got a 365-horse 460 to haul your 5,000-pound slab-o-luxury (and its insensate rockstar passengers) around. Fins hadn't totally disappeared by '69, but they were pretty subtle. When you see this in your rearview mirror, don't hit the brakes! If we were to give this car the official Jalopnik Stamp-O-Approval treatment, we'd do the usual cam/heads/intake/headers routine on the engine, tint the windows far beyond legality, put the biggest rubber possible under it, and install Cherry Bombs. Then, a quick trip to Tijuana for a red velvet diamond-tufted interior- as much like an 1895 French cathouse as possible- and fur headliner. Oh yeah, plus it needs a Toploader. 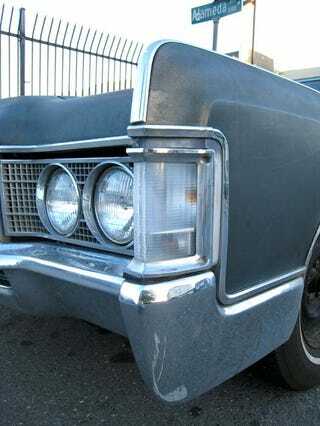 You can still see the slab sides of the more famous early-60s Continentals here, but the grille is showing hints of the silly-yet-righteous Malaise Era Lincolns to follow in the next decade.